This scribble was published on Friday, May 18th, 2012. You can follow any banter on this scribble with the RSS 2.0 feed. You can share your inspired musings after typing the anti spam word near the bottom of the page. But no Pinging because its too naughty. Hear, hear! I shall print that out and pin it to my neighbour’s door later on. Also: if it so happens that you are plagued by the blues in the night (despite what your Mama done tole you when you was in pigtails http://youtu.be/OL809W4Cl4E ) then you can be a little comforted by the nightwatchclocks’ friendly cries: Three o’clock and all is well, Four o’clock and hanging in there, Five o’clock and Radio 4 starts up soon. 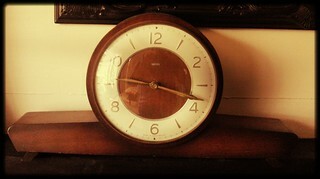 A friend, borrowing my sofa one night, demanded that I ‘switch my clocks off’. I could have had him for inappropriate language. Fox cubs playing rugby football with the garbage, on the other hand, is a genuine cause of sleep disruption. Fun to watch, but messy in the morning.